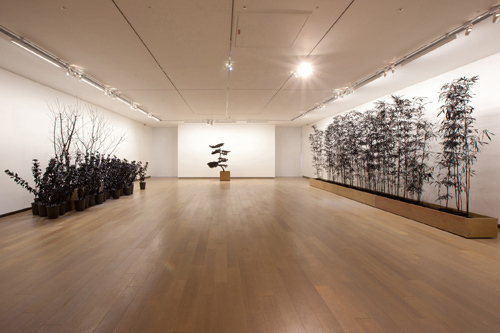 Jennifer Wen Ma’s first solo exhibition in Taipei, “Inked,” opens with Inked Friendship, 2011, a live-feed projection of a tree in southern Taiwan that has been painted with mo, black Chinese ink. Most of the ten works in this multimedia show explore applications of mo, expanding it beyond its uses in traditional Chinese painting. Taken as a whole, however, the exhibition builds a connection between the longevity of the ink and the long life of memories. The series “Inked Plants,” 2011, for example, offers several types of plants that were repeatedly painted with mo until their surfaces became black and glossy, like three-dimensional renditions of brush paintings. But the piece moreover demonstrates the impermanence of mo: On opening day there were already small green leaves, and a few days later blossoms were bursting forth and signs of fading ink could be seen on the wilting chrysanthemums. The use of ink, this time animated, reemerges in the video Brain Storm, 2009, where an ink brush makes fine lines on paper in the shape of a man and a horse. The two figures move through a landscape, which is sometimes wiped and then inked again. The liquid takes shapes that resemble mountains, seasides, and the sky, implying that the characters are taking a lengthy journey. The excursion does not end there; in Non, je ne regrette rien (No, I Regret Nothing), 2011, the viewer walks next to mounds of dark sand punctuated with objects such as the skeleton of Ma’s beloved cat, along with other items that provide a view into her life, and her memories. On the sound track we hear Ma singing the eponymous song made famous by Edith Piaf. This piece especially shows that that to ink something is more than just to apply substance to a surface, but it can also be a means to examine the recurrent presence of memories.